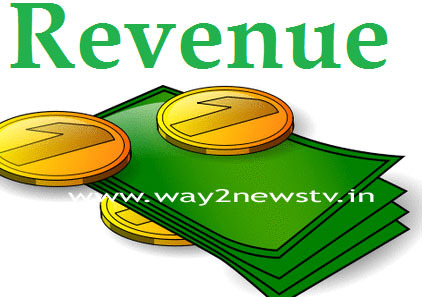 Hyderabad, Jan 8, (way2newstv.in):The revenue collection of 50 per cent of the state budget estimates for the November end of the current fiscal year did not exceed. The government has collected Rs 52,733.13 crore from various taxes till April-end. Gross collection of gross domestic product in July stood at Rs 13,120.66 crore, up from November. That means, the total amount of Rs 1,13,083.04 crore for the current fiscal, the state government is to earn a revenue of Rs. 65,853.79 crores. In other ways, the state is Rs. On 31,903.48 crores, I would like to raise the financial resources in the form of debt. 20,313.21 crore is provided. According to the Budget estimates, tax collections and liabilities amounted to Rs. So far, Rs. 1,44,986.52 crore has been raised to Rs. Only 73,108.48 crores is possible. That means you have only a little more than half. Within four months, the sale of selstocks, GST, excise, liabilities, grants from the center. 72,493.26 crore. Sales tax for this financial year is Rs. In the budget of the state government to earn 46,500 crores, by November, only Rs. The gross collection from July to July was Rs. 13,120.66 crores. Grants from Center, Rs. It was Rs 26,857.67 crore in the first eight months of the current fiscal. 5,145.43 crores only. With the arrival of GST on the sidelines, the savings dropped due to lack of timely supply of grants from the center in the expected direction. The Budget Estimates According to Me, by March 2018, If you have to assess the financial condition of the eight months in case of surplus revenue of Rs 4,571.31 crore, 3,150.43 crore. This situation has become a challenge for the government to bring this situation in the next four months. With the completion of one month already, the whole situation is to be settled within three months. 20,313.21 crores. It is still worth Rs. 5,783 crores only. The cost is quite a bit of budget estimates. Revenue expenses, cash flow, employees' wages, interest on liabilities, payment of advances, etc. These eight months are worth over Rs. Spent 95,200 crores. Compared to the past VAT, the GST system has been reduced to the extent of taxes on many items. This is likely to be susceptible to budgetary expectations. Sales tax (petroleum products) collections have declined marginally even though GST is not much cheaper than October. Excise revenue earned by alcohol consumption declined by two-thirds in November to Rs 1411.83 crore (Rs 1411.83 crore) 568 crores respectively. In the current fiscal year's income is a bit worrying, as the leaders of the ruling party have already commented that the government will spend huge amounts of money on welfare and development projects for the electoral budget. What is the appropriate source of income is now a challenge to the finance ministry officials. Non-tax revenues, stamps, registrations, excise and other taxes are likely to be inadequate to the cost of the government in the upcoming Budget. Even in the last financial year, the overall revenue deficit remained unchanged from April to February. 4,459 crores. The situation came to an end when the government was looking at the end of the financial year and the government had taken a serious view of the debt. If this is the recurrence of the same, revenue will be improved and it will be possible for the welfare and development as the government thinks in the election budget.